My similar thought is that politicians said we were there because of the ‘domino theory’. Generals said we had to win the war. Company commanders said we had to take a geographic location like a mountain. When the shooting started we didn’t think about the domino theory or winning the war or even taking a piece of ground. The first thought of every person was to save you own rear end. However, time and time again I personally witnessed young men set aside that innate reaction of personal safety to risk his life for a friend. 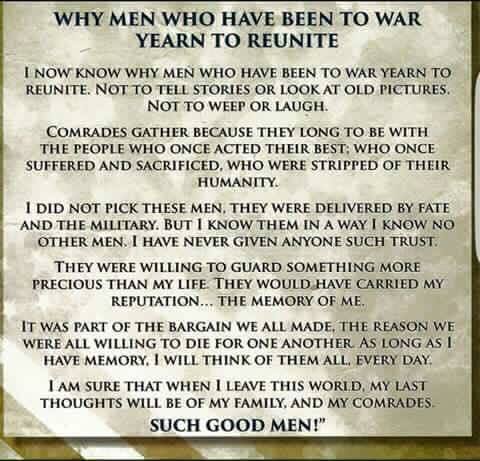 I was, am, and will be in awe of the men I served with. I am proud of my military service. I am proud I served as a medic and I’m proud I served with the heroes of C/1/22.